Native communities have been flooded with prescription pain pills. The text message at 4 a.m. was short and to the point. Rory Wheeler sprang from bed and hurriedly pulled on his uniform. It was late October 2016, and Wheeler, an EMS worker for and a member of the Seneca Nation of Indians in New York, rushed to the scene. But it was too late: A young woman on the Cattaraugus Indian Reservation had overdosed and was pronounced dead at the scene. Wheeler’s day, however, was only getting started. Three hours later, his pager went off again. Minutes later, another young woman was pronounced dead on arrival ― again, from an overdose. Both women were Seneca tribal members in their early 20s, and both were mothers of young children. It was also a moment of reckoning for the Seneca Nation, a tribe of only 8,000. Having survived numerous wars, famine, disease epidemics, the violent breakup of their territories and the consequent legal struggle to achieve sovereignty, the tribe now faced an existential crisis — one that had been brewing in the shadows long before anyone grasped its impact or could organize a response. No longer a discrete series of isolated incidences, opioid addiction had taken on a genuine sense of urgency. As the opioid crisis continues to explode across the country it has ravaged tribal communities from Alaska to Maine. Remote and isolated, with limited resources to combat the epidemic’s relentless, creeping sprawl, Native Americans and Alaska Natives have been more severely impacted than any other demographic in the country. According the Centers for Disease Control (CDC), over 600,000 Americans died from overdoses from prescription opioids and heroin between 2000 and 2016 — a number that continues to rise. And while every racial, economic and age group has been impacted, the details hidden within these statistics paint a dark picture for Indian Country. Though Native Americans comprise only 2 percent of the total U.S. population, they have experienced the highest rate of opioid-related fatalities, including both prescription and illegal drugs — dying at almost double the rate of African Americans and Latinos combined. Heroin overdoses alone among Indigenous people increased 236 percent from 2010-2014. Thank you for participating in National #TakeBackDay! Experts attribute the problem in part to the over-prescription of painkillers at Indian Health Service hospitals and clinics across the country. Many tribes have responded by clamping down or even eliminating opioids from their drug formularies. Payment says that tribes receiving “direct services” from Indian Health Service have little choice but to accept policies and procedures that, he believes, are under the direct influence of the pharmaceutical industry. Meanwhile, tribes across the country struggle with the basic problem of how to attract and retain physicians and health professionals in remote rural areas. Kathleen Preuss is the director of social services for the Upper Sioux Community in Granite Falls, Minnesota. With only 583 members, it is among the nation’s smallest tribes. It’s a community that she likens to “one big family,” but that bond has not spared it from addiction and its consequences. For the Upper Sioux, as with tribes across the country, funds intended for basic human services, such as elder programs, housing services and heating assistance, are being redirected to pay for additional law enforcement, social services, overloaded court dockets and a seemingly never-ending turnstile of treatment facilities and programs, few of which seem to be helping those in need. Preuss says that there are 28 children in foster care at Upper Sioux, a high percentage that has created a concurrent crisis in Indian Child Welfare. The crisis, she says, just increases the possibility that the children may be put into permanent placement outside the tribe, something that poses an existential threat to such a small community. Preuss largely blames the pharmaceutical industry. It has played a major role in creating and sustaining the opioid crisis, she says, a situation that amounts to nothing more than legalized drug pushing. 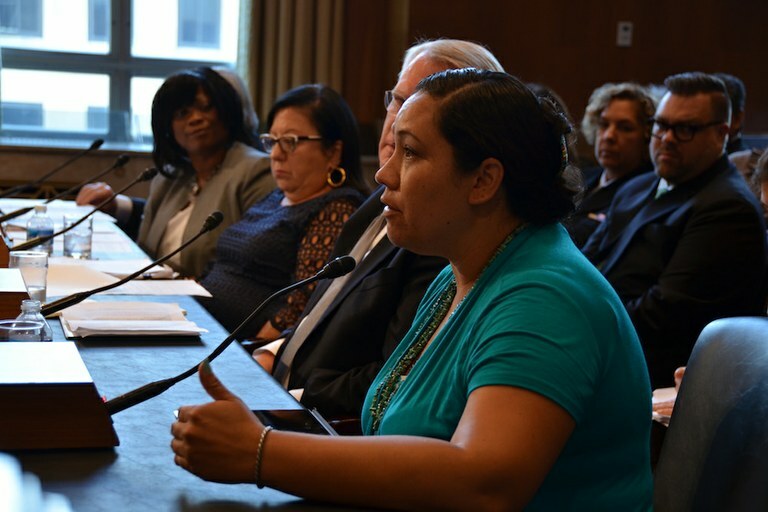 Sunny Goggles, director at the White Buffalo Recovery Center on the Wind River Reservation, testifies about the impact of opioids on Native Americans in 2015. As the attorney general of the Cherokee Nation, which has over 330,000 citizens and is one of the country’s largest tribes, Todd Hembree has seen his fair share of legal battles both large and small. But nothing had prepared him for this new threat, which seemed to emerge out of nowhere. In August 2016, the weekly staff meetings in Hembree’s office were cramped and hot. It was standing room only, with nearly a dozen lawyers, legal assistants and various support staff crammed into the wood-paneled conference room to discuss, assign and prioritize cases. When it came time for updates from the ICWA team, Hembree noticed a sharp increase in foster placements within the tribe’s jurisdiction. Previously, the tribe may have identified one or two ICWA cases a month. Now, over the course of only weeks, nearly two dozen Cherokee kids had been placed in state custody. Shocked and bewildered at the sharp spike in ICWA cases, all of which involved interlocking addiction, incarceration, inadequate treatment facilities, overdoses and fatalities, Hembree realized that this was rapidly becoming a major problem for the tribe. There were enormous legal, fiscal, social, cultural and sovereignty consequences at stake. Hembree began researching and talking to people within the Cherokee Nation, as well as his tribal counterparts across the country. Every single tribe he contacted reported similar, if not identical, problems, including a nationwide spike in ICWA cases on reservations and in areas with large Indian populations. Over the next several weeks, however, Hembree became aware of another sinister pattern that was clearly not coincidental: Tribal communities across the country, not just the Cherokee Nation, were being flooded with large volumes of prescription pills. The industry pulled off a major victory in early 2016, by supporting legislation that made it virtually impossible for the U.S. Drug Enforcement Agency (DEA) to stop large or suspicious shipments of opioid painkillers ― even as the industry was making billions of dollars, according to a report from The Washington Post and 60 Minutes. Passed in April 2016, the “Ensuring Patient Access and Effective Drug Enforcement Act” shields drug companies from any effective oversight or enforcement of laws intended to protect the public from the unchecked flood of highly addictive pills into vulnerable American communities. And Native Americans, whose communities are among the most impoverished in the Western Hemisphere, are the most vulnerable. For centuries, they have suffered from the effects of war, disease, forced relocation, famine, poverty and intergenerational trauma — all of this reflected in the poorest health statistics of any racial group in the United States. As a result, tribal governments, law enforcement, schools and health systems found themselves overwhelmed, ill-equipped and underfunded to deal with the catastrophic effects of this rapidly emerging public health crisis. In the fall of 2016, Hembree convened a task force to find a solution to the problem in one of the country’s largest tribal nations. For the next eight months, Hembree and his staff, working with outside counsel hired by the tribe, rapidly began to gather data and build their case. In April 2017, only a year after the passage of “Ensuring Patient Access,” the Cherokee Nation filed suit in tribal court against manufacturers, distributors and pharmacies, including Wal-Mart, CVS, Cardinal Health Inc., McKesson Corporation and AmerisourceBergen ― the first lawsuit of its kind in U.S. history. In January 2018, U.S. District Court Judge Terence Kern ruled that the Cherokee Nation Tribal Court lacked jurisdiction to try the case in its own court system. Subsequently, the tribe filed the case in Sequoyah County State Court in Oklahoma. In early March, the drug company defendants moved to have the case combined with a federal case in Ohio, but Hembree says that the tribe and its legal team will continue to push to have its case heard in Oklahoma. On March 15, McKesson Corporation and the other defendants asked a federal judge to deny the tribe’s bid to litigate its claims in state court. None of the defendants responded to High Country News’ request for comment. Since the initial filing last year, hundreds of other tribes, counties, towns and states have followed the Cherokee Nation’s lead and filed their own suits, many of which have been combined into a massive federal multidistrict litigation case (MDL) in the Northern District of Ohio. Purdon and his colleague, Brendan Johnson, are representing tribes in the Dakotas, including the Flandreau Santee Sioux, the Rosebud Sioux and the Sisseton-Wahpeton Sioux and the Standing Rock Sioux ― all of whom have filed suit in federal court against major manufacturers and distributors of opioids, alleging deceptive trade practices, negligent conduct and violations of federal racketeering laws. In January, the Ohio MDL was assigned to Judge Dan Polster, a former federal prosecutor, who said the federal court system was an “illogical place” to address the crisis. He vowed to reach a “quick” global settlement by the end of this year. The civil docket in that case, however, is now well over 100 pages ― and counting. Cormell says that, owing to their sovereign status, tribes should not be included in the MDL. “Our team is now in the difficult position of trying to decide whether we should take our chances in Wisconsin state court,” he says. The St. Croix have only 1,100 members, and yet they have experienced hundreds of overdoses, according to Cormell. And although the tribe hopes to recover some of the expense incurred in fighting the epidemic, Cormell says cash damages will never fully repair the damage that’s been done to this small, tightly knit community. Now 20 years old, Rory Wheeler still works as an EMS for the tribe’s fire department, and he has become an advocate for the use of the Adverse Childhood Experiences or ACE, questionnaire, which quantifies and identifies risk factors that may lead to drug addiction and other health problems. Wheeler says that learning about the “a moment of epiphany” that raised his awareness of the high risk factors among Indian people in regards to generational substance abuse and historical trauma in first aid treatment. After the two overdose deaths in October 2016, the tribe also redoubled its efforts to combat the crisis. Seneca Strong, for example, is an initiative that is focused on drug prevention and recovery, peer outreach and recovery support, according to its website. In addition to prevention and education, the program is guided by traditional healing practices that have been handed down through the generations that are culturally sensitive to their tribal members, including talking circles and lacrosse. 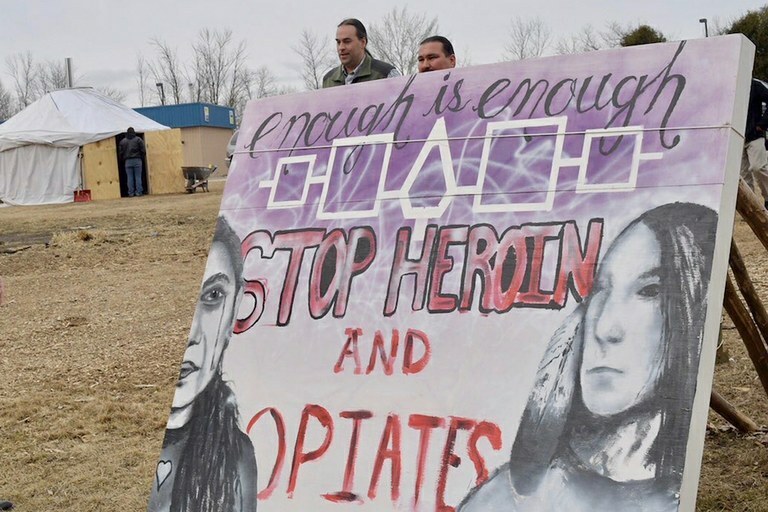 A sign on the Oneida Nation highlights how opioids has affected the community. Suzette Brewer is a writer specializing in federal Indian law and social justice. She is a member of the Cherokee Nation.